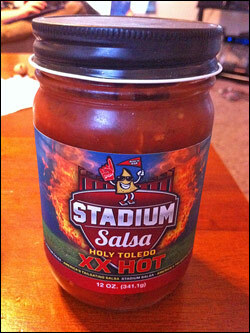 I remember the first time I met Greg Shepherd, owner of Stadium Salsa, vividly. We were booth in the foyer of Jungle Jim’s Oscar Event Center several years ago, where the Weekend of Fire was about to go down. I was waiting for my bloggers booth pass while he was trying to obtain his pass for being a vendor that year. Long story short, we talked for a minute, exchanged business cards, and later met each other up in the main ballroom where the show was held. That day I learned that Greg’s food offerings weren’t the most flame-o-riffic thing ever to hit a spicy food show, but they were pretty damn tasty nonetheless, including Stadium Salsa’s Mexicali Cheese Dip (which interestingly enough, was interesting enough to Jonathon Passow’s palette to review three years ago on The Hot Zone Online.) The few jars of Stadium Salsa’s products I took home that year were the last of that Bowling Green, Ohio-based company I’ve had.